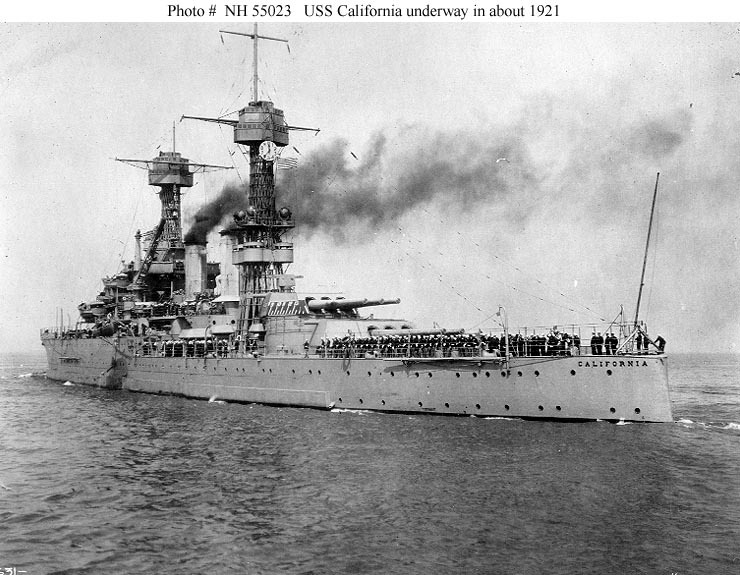 USS California, a 32,300-ton Tennessee class battleship, was built at the Mare Island Navy Yard, California, and commissioned in August 1921. During the 1920s and 1930s, she actively participated in the activities of the United States Battle Fleet, often acting as flagship. In 1925, California was one of the ships that conducted a major trans-Pacific cruise to Australia and New Zealand. 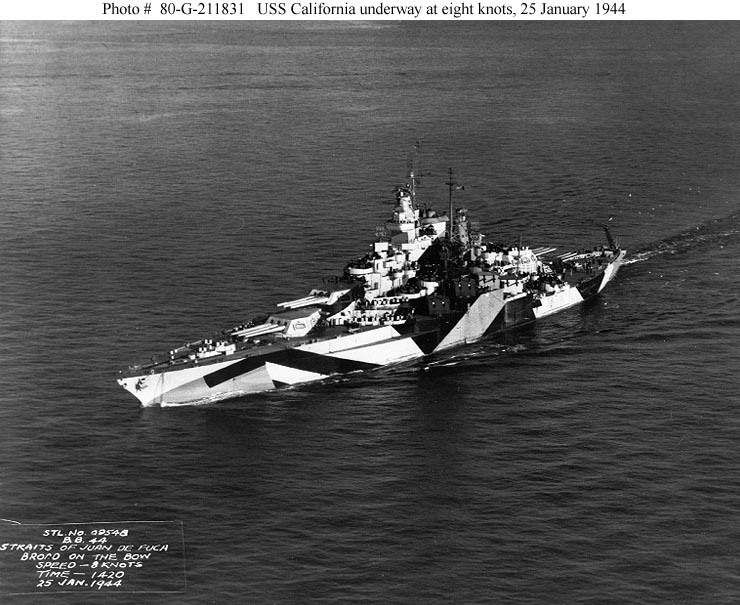 With most of the fleet, California deployed to Hawaii in 1940 and was based there as tensions rose in the Pacific over the next year. When Japanese carrier planes raided Pearl Harbor on 7 December 1941, she was badly damaged by torpedoes and bombs, slowly settling to the harbor bottom over the next few days. Her salvage, repair and modernization represented a major undertaking by the Pearl Harbor and Puget Sound Navy Yards and was not completed until January 1944. 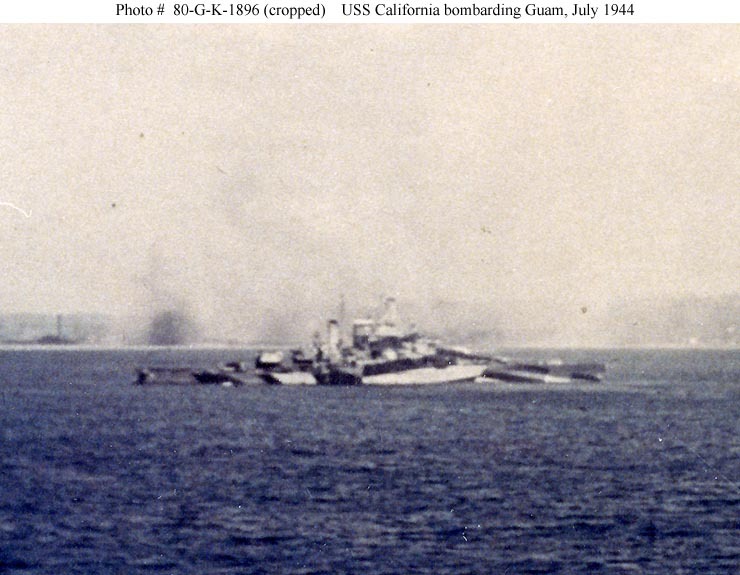 Over two and a half years after she was sunk, California reentered combat, providing heavy gunfire support for the invasions of Saipan, Guam and Tinian during June and July 1944. In October and November, she took part in the Leyte Campaign, including the 25 October 1944 Battle of Surigao Strait, history's last fight between opposing battleships. In January 1945, California participated in the Lingayen Gulf invasion. Damaged by a "Kamikaze" suicide plane on 6 January, she remained in action for more than two weeks before steaming to the U.S. for repairs and an overhaul. California returned to the Western Pacific in June 1945, in time to take part in the final stages of the Okinawa campaign. She covered occupation activities in the wake of Japan's surrender, then sailed for the Atlantic by way of the Indian Ocean and the Cape of Good Hope. 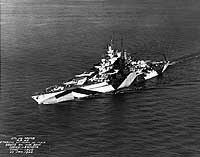 After her arrival at Philadelphia, Pennsylvania, in December 1945, the battleship was generally inactive until her formal decommissioning in February 1947. 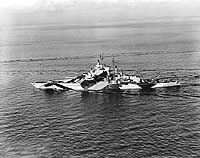 After twelve years in the Reserve Fleet, USS California was sold for scrapping in July 1959. 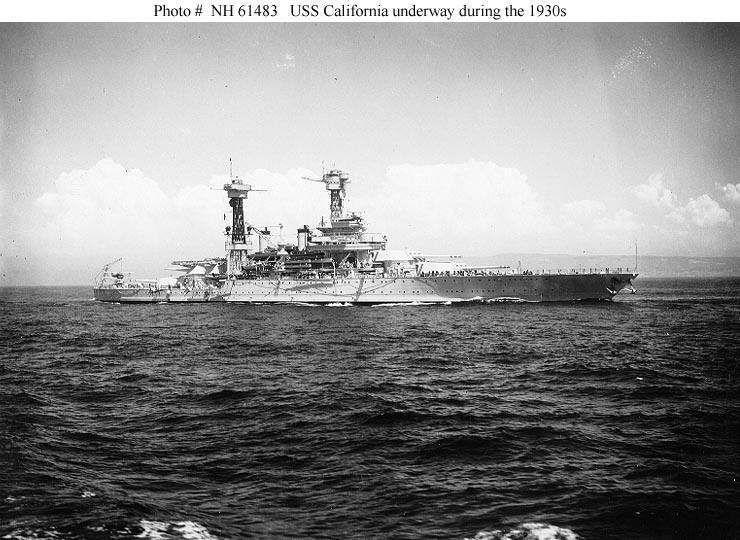 This page features selected views concerning USS California (BB-44). 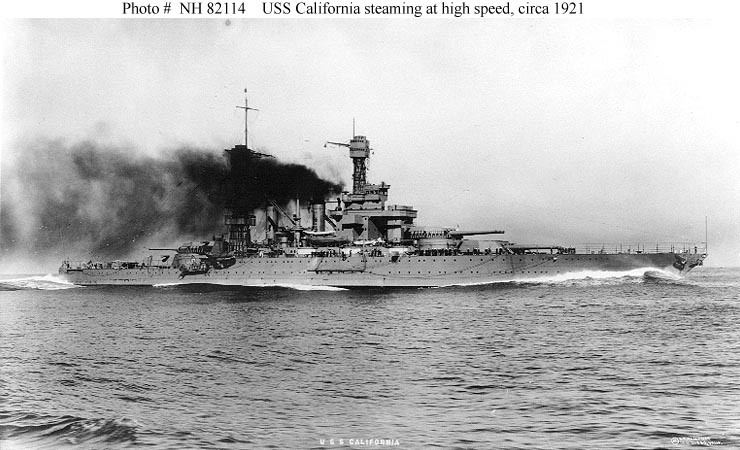 USS California (BB-44) -- Part II. 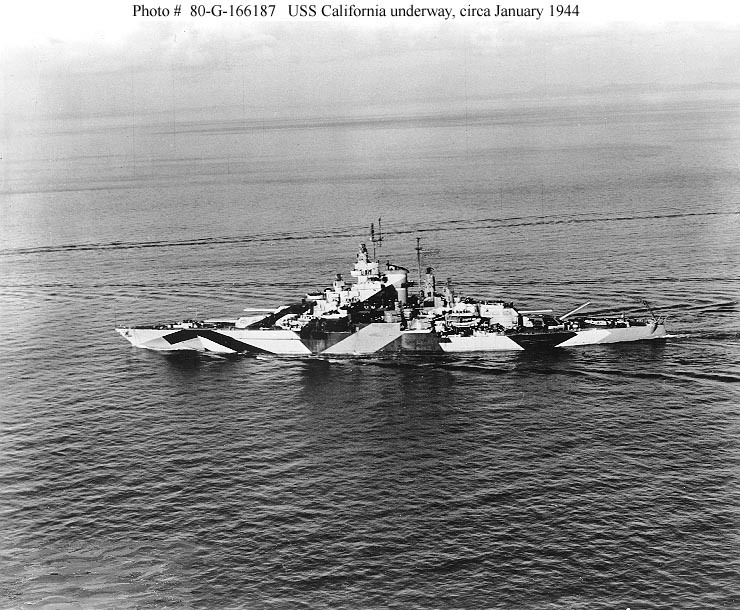 Salvage and Repair of USS California, December 1941 - October 1942. Steaming at high speed, circa 1921. Photographed by O.W. Waterman, San Diego, California. Collection of LCdr. Abraham DeSomer, donated by Myles DeSomer, 1975. Underway shortly after her completion, in about 1921. At sea, during the middle-1930s. Underway at eight knots in the Straits of Juan de Fuca, Washington, on 25 January 1944. The ship is painted in camouflage Measure 32, Design 16-D. Underway, probably in the Puget Sound area, circa January 1944. USS California (BB-44) bombarding Guam during the invasion operation, as seen from USS New Mexico (BB-40). The ship is painted in Camouflage Measure 32, Design 16D. This image has been cropped from Photo # 80-G-K-1896 to emphasize the ship and her camouflage pattern.